The first picture are of the house before we bought it. We were able to take some pictures while the home inspection was going on. There were WAY worse parts of the house then the bedroom but I needed to make it my own. So after 3 years of living here we took the plunge. Although, we are not done yet, curtains need to be pressed and hemmed, artwork needs to be painted above the dresser, and don't even get me started on the carpet! Ug!!!! I figured that it was far enough along to share though, hope you enjoy it as much as I do! 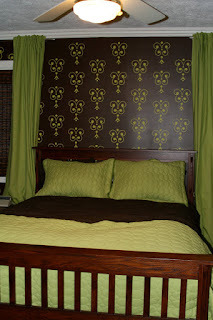 Yes, that is a Stampin' Up Stencil that I used with Hep Green latex paint overtop of a nice chocolate color. All my paint comes from Sherwin-Williams, I really believe that they are the best & that's not just because my BIL works for them! 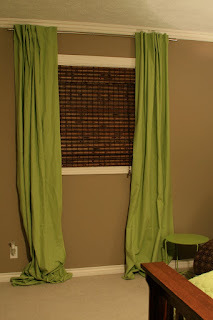 :) I made the curtains myself using "apple" color decor fabric from the local fabric chain. I even used SU! twill tape for the backs to make the pleat pockets, might not be the right way to use the product but it worked great. The chocolate parachute duvet cover is from West Elm (my Christmas gift this year!!!) and the green quilt is from Target, along with the green end tables, & lamps. The funky chair is a repurpose piece from my living room but it was from EQ3 a few years ago. 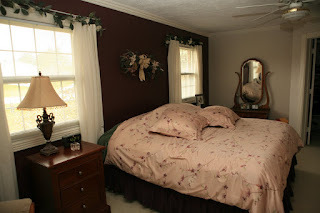 The bedroom furniture is from Bedroom Expressions, when we were married over 8 years ago. Last thing is the shades, they are from Lowes, my new fav store. Hope you enjoyed my before and after! As, most of you know Sale-A-Bration has been going strong and there is only one week left, phew! (If you still are thinking and wishing about ordering you still have time BUT not much time! I was able to take part in many great events over the last month but one was especially special. I set up my booth at Freedom Schools for a fundraiser for Angie Peters. Right now Angie is battling cancer, she is such a great person. I only chatted with her for a few minutes but could tell that she is so great and SO BRAVE! Plus, her sister is one of Zoë's nurses! :) I wanted to let you all know that the fundraiser was a success and they were able to raise enough money for her treatments and prescriptions through this next round! Think of Angie as she overcomes this battle! Secondly, I have finished my 6 credit grad school class! Thank goodness! During the "day" I am a professional counselor at an alternative high school that I love, but I needed 6 grad credits by June. So in order to keep my "teaching" certificate I enrolled in a grad class that was 6 credits in 10 weeks. I made it though will only several LONG nights of studying. So, if you are looking for a Certified Global Career Facilitator, I'm your gal! Check back soon because I am taking pictures off all my recent projects tonight, including my bedroom before and after using SU! stencil! The next crop is October 8-10 here at the Howard Johnson in Grand Rapids, MI, but you have to sign up soon if you are interested! Like right now, last week they only had 15 spots left! Yikes!!! At Croppin’ Chicks Getaways, you will feel pampered from the moment you arrive as you enjoy 48 hours of non-stop scrapbooking. Upon arrival at Howard Johnson Plaza, you will be personally greeted by Jacqui and Jennifer and escorted to the Crop Room and your table. We want to know each of our guests personally and by name, therefore we limit our weekend events to 50-75 people. Each guest will receive their own 8 foot table. The Howard Johnson Plaza naturally creates a pampering environment. Your registration fee includes drink service and delicious meals throughout the weekend. All of our events include on-site shopping, creative sessions, contests, lots of games, prize giveaways and unlimited use of the Cropping Barnyard which includes 2 Cricuts, multiple cartridges, punches, scrapbook tools, and idea books. The price for a weekend getaway is $140. We are currently running a special of $125! The price of the hotel is not included in this price, as we believe this frees our guests to choose their own roommates and final price of the weekend. You may choose to share a room with up to three other women, or book a room for yourself for much needed alone time. Room block information will be provided with confirmation of your weekend. I am SO into making projects with the Big Shot and fabric right now. I thought I would share a few with you today. The first project is several hair clips for a young girl. Easy to do, just cut out some felt layer, insert eyelet and brad. Attach to a hair clip wrapped in ribbon. EASY EASY. The second project is a scalloped circle pin. I simply used the Big Shot to cut out four of the larger scallop circles and two of the smallest. The fold the larger circles in half and weave them. Stitch in the center to hold them together. Layer the two small circles on top and punch a hole with you crop-a-dile, insert rhinestone brad. I then heated the edges with my embossing gun to melt the edges. This is what makes it look fluffy. The third project is a wristlet. This project was inspired by SU! 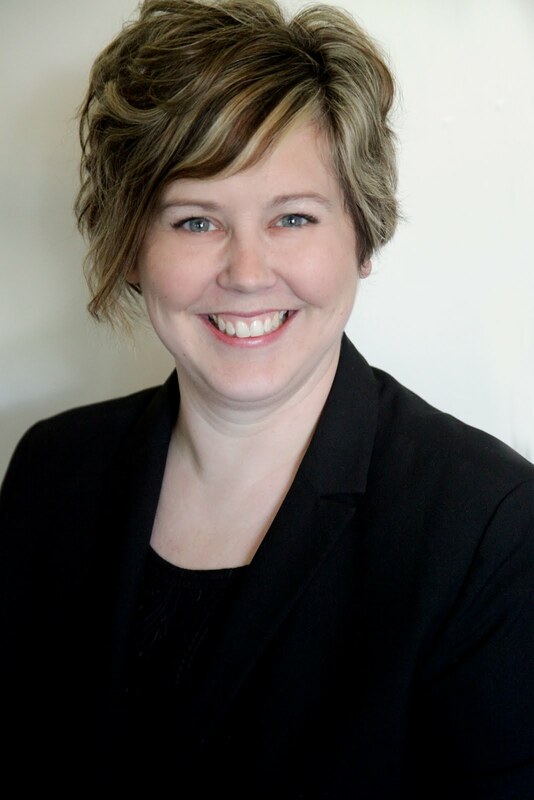 's co-founder Shelli Gardner. The wristlet was made using 3 different fabrics and the circles #2 die. To hold the circles together I used a jumbo eyelet and then put a rhinestone brad through the center. I attached all three to a felt piece cut out with the perfect setting die & attached ribbons to the sides so you could tie it on your wrist. Below are the dies that were used in these projects. Click on them to take you to the SU! shop. Remember, when you shop through my website you will enjoy the preferred shopping price.